Why do mussels get fatter in winter months? How come some mussels are light orange and some dark? 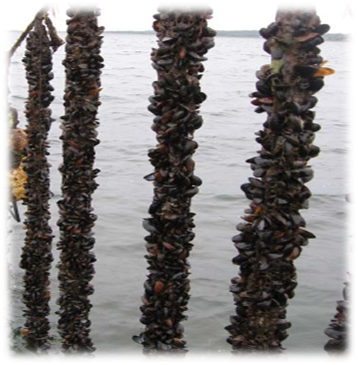 Can mussels move or do they stay put after settling on a piling? We learned the answers to these questions and more, when Michael Mussig and Michael Ferguson from Canadian Cove stopped by the office. Canadian Cove is the premier Prince Edward Island mussel grower, and the Mikes dropped in to chat about mussels, the farming process, and to cook up some samples for us to try. As it turns out, you can start your own adventure in mussel farming with nothing more than a frayed rope. In late spring, mussels naturally begin spawning as water temperatures rise. To catch the mussel larvae, farmers put long collector lines in the water. This can be as simple as an old rope held afloat by buoys. The mussels float in the water until they settle down on the rope’s surface. By fall, the mussels have grown to about half the length of your thumb, and are ready to be collected for socking. No, this has nothing to do with punching the mussels! It actually refers to the long mesh tubes that the mussels will placed inside, somewhat akin to a sock. The mussels are roughly sorted into similar sizes before being placed in the socks. This helps maintain uniform shell sizes because the smaller mussels aren’t competing against their larger brothers. Then the mussels are stuffed into the sock, the same way you would fill a sausage casing. Though the mussels are on the inside of the sock now, over the next few months, they will gradually move to the outside of the sock in their continuing quest for food and nutrients. That’s right, mussels can move through their “beards” or byssal threads, which are sticky filaments secreted to help the mussel cling to objects. By attaching a thread to an anchor, then shortening the thread, a mussel can slowly move toward an object. As the mussels move outwards, the sock will collapse into a thin rope in the center of the mussel column. Canadian Cove spaces their mussel lines out further than usual so that the mussels grow quickly and uniformly. Since the mussels are cultivated on ropes rather than on the ocean bottom, they have clean, unmuddied flavors and a firm texture that is free of grit. The waters surrounding Prince Edward Island are some of the cleanest in the world, and you can certainly taste it in these robust mussel meats. After about two years in the water, the mussels are harvested. Around this time of the year, mussels are at their peak, becoming sweeter and plumper as they prepare for winter. But what happens if there’s ice on the water? Knowing that some oyster farmers close up shop when the water freezes over, we asked how Canadian Cove kept up with the year-round demand for mussels. 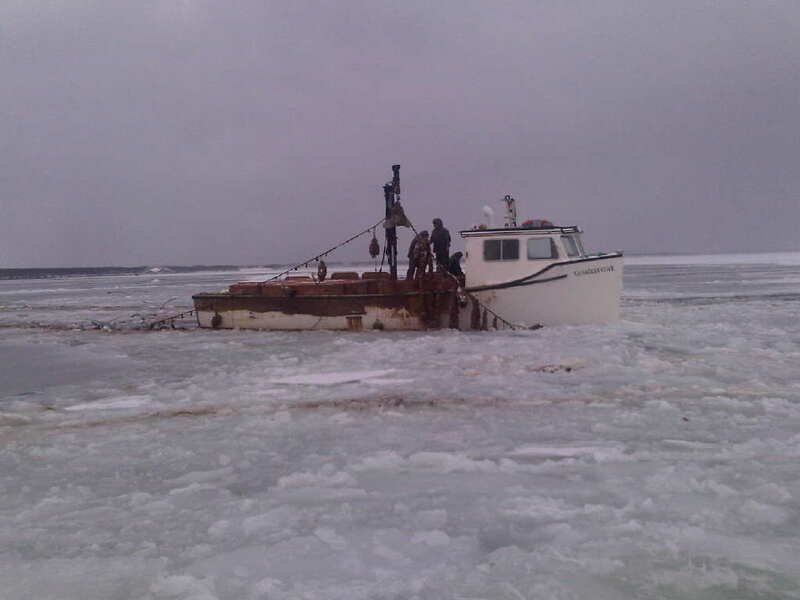 It turns out that they have a number of open water leases that are deep enough that they don’t freeze in winter, and in some areas they have divers who can ice harvest. Once the mussels have been harvested, they are gently washed, graded and debearded. You may have heard that debearding shortens the shelf life of mussels. This is generally true if you yank the mussel’s beard out, but modern processing equipment pinches off the beards rather than pulling them out forcefully, so the mussel remains healthy and untraumatized. The mussels are stored for a short period in saltwater storage tanks with air bubbled through them, which gives them a chance to recuperate from being harvested. Then these ambassadors for PEI are packed into bags and eventually make their way to a steaming pot near you. When you purchase mussels, the shells should look moist and they should not smell strongly fishy or unpleasant. After you bring them home, they should be stored in the coldest part of your refrigerator, covered by a damp towel. Canadian Cove’s mussels are pot ready, so all you need to do prior to cooking is to give them a quick rinse. If there are any open mussels, give them a tap on the shell and throw out any mussels that do not close. If you’ve ever inspected a pot of mussels before, you may have noticed that some are a creamy shade of light orange, while others are a more vibrant dark orange. The color difference is how you can tell female from male mussels: the females are more colorful, “like women with make-up,” quipped Mussig. We enjoyed the mussels steamed with a splash of white wine, a knob of butter, some Thai sweet chili sauce, and a sprinkle of cilantro and red onion. However, they would have been delicious with many other accoutrements, or even just steamed alone without any additional ingredients. For inspiration, you can check out our recipe for creamy mussels with blue cheese, or simply look around your kitchen tonight and see what catches your eye. If you’d like to purchase PEI mussels from Element Seafood, just give us a call!